Lately I’ve gone through a period of very little personal spiritual practice. I’ve been wanting to get back into using my altars; I have kind of a sprawling altar on the mantle and adjacent shelves in the den, and a compact version in the kitchen. Most days I do a variation of Sigrdrifa’s prayer at my bedroom window in the morning. This seems to be my default setting for bare minimum personal spiritual practice. I have had several kinds of daily devotionals in the past, usually taking the form of ADF-lite, a simple CR ritual, or a blot/hussel. For consistent daily practice, however, none of these forms have staying power for me. Also, though my background is in Norse and Celtic hearth cultures, sometimes I don’t want to be very culturally specific. I am a squishy/soft polytheist after all, and I have embraced (my own version of) Waincraft in recent years. While other people are at home, I’d rather not be overheard. When I have a spoken daily devotional, I often end up saying the same things every day, to the point of meaninglessness. There are many times I just really don’t feel like speaking. Also, not feeling obligated to speak frees up my mind for deeper contemplation and also allows me to concentrate a little more on actions. Before doing ritual, I make sure the altar surface and items on it are clean, arranged well, and dusted. Then I refresh the water bowl/cauldron. Before replacing it on the altar, I first lift it in reverence to the deity/spirit images. I dab some of the water from the water bowl on my forehead and do a clearing/grounding. I then anoint the statues on the altar with the water. If I’m drawn to saying something here, it may be “Water cleanse me.” or “The Waters of Danu flow through all.”. I light the candle on the altar and raise it to each of the statues as I did with the water (when refreshing the altar). I then set the candle back in place, cup my hand above the flame, then touch the same hand to my forehead to receive a fire purification/blessing. Here I might say “May the fire of the gods, hallow.” or “Thunor hallow.”. I light an incense stick or cone and circle it around each of the statues/images. I say a simple hail to each entity being honored or make a mental connection equivalent to an evocation. Occasionally, I may place other offerings in a bowl on the working surface of the altar, if I’m at the altar in the den. At this point, if I’m not rushed, (and especially if I’m at the altar in the den instead of the kitchen,) I take a little time to meditate, contemplate, and further connect to the deities/spirits/powers. I ask for guidance (mentally or aloud) and draw a rune for the day. I end this daily devotional with simple words or thoughts of thanks and touching the edge/feet of each statue/image in reverence. When I feel the need, I use my usual words of ending inspired by the Carmina Gadelica: “As it was, as it is, as it evermore shall be, with the ebb, with the flow, blessed be.”. This may be the simplest daily ritual I have ever adopted that still involved the use of materials and an altar. There’s really nothing to memorize nor ways to goof it up, and though I’ve just begun to use it, the feel of it is timeless. If it inspires you too, feel free to use it. Over the past few months I’ve been going through a major transformation in lifestyle. It started as a diet. In my younger days I never would have thought I’d go on a diet; I’ve been skinny most of my life. As I’ve been getting older though, my metabolism has been slowing down. And even though I wouldn’t consider myself overweight, I was still heavier than I’d ever been while not pregnant, and wasn’t happy with the heaviness and bulk of my stomach. So I started my diet by just counting calories and did have some success. Then a few serendipitous things happened that led me to try vegetarianism again. The first of these was that my grove was going to meet at a center that was hosting a Thanksgiving vegetarian potluck, and they were letting us meet there only if we could help clean up from the potluck that was happening right before. So I decided that I might as well attend the potluck if I was going to help clean up, and then stay for my grove meeting. I looked up a wonderful vegetarian recipe to bring and all the food there was great. Well, the next week was the actual date of Thanksgiving, and upon learning that my girls weren’t coming down for the holiday and it would just be the three of us, I decided to sign us up for the UU church potluck. It just so happened that the only slot still open to bring was for vegetarian mains. I brought the same chickpea dish I had made for the other potluck. There was a lot more people and food there than what I thought there would be! With so much to choose from, I decided to just go with all vegetarian for my Thanksgiving plate. I ate my fill and had a big plate of dessert too. And guess what, I actually lost a pound that day instead of gaining. It was then that I decided to begin a transition to a vegetarian diet. Over the next couple of weeks as I phased out meat, I lost ten pounds. The last time I ate meat (or ever will again) was at a Yule celebration I attended in December. In my enthusiasm, I began looking up vegetarian videos on youtube, to keep myself motivated and on track, and perhaps get a few pointers. What I found was a myriad of reasons to go all the way vegan. Needless to say, I got my eyes opened about factory farms, and the milk and egg industries. All the old arguments that I ever heard (and used myself) against veganism/vegetarianism, were very logically shut down. The most compelling of these was a video titled 101 Reasons to Go Vegan. I began to become motivated, not so much by weight loss, but more for compassionate and environmental reasons. So now I’ve been transitioning to vegan, and it’s been a lot easier than I thought it would. After about a week, I didn’t crave cheese anymore. I tried vegetarianism two other times in my life. The first time, I was married to someone who was strongly (and angrily) opposed to it, and the second time didn’t last very long because I didn’t have the information and motivation necessary to succeed. Now, I can look up any kind of vegan recipe I could ever want on pinterest, and find tons of motivational videos on youtube. I’ve already been vegetarian longer than I was the other two times I tried. And it’s been easy. I Was Wrong… and I’m so so sorry. Over the years I have had a few people tell me that they can’t practice their Pagan spirituality because of their circumstances. Usually it is because of living with a conservative family member. While I have never really experienced this myself, I do get the feeling it is a common problem that affects not just the young. For some folks, hiding their true spiritual beliefs may be a matter of survival if they are dependent on others for home and shelter. Whatever your reason for not being able to practice openly, I hope the following ideas and insights may be of help to you. And if you go to a church where all kneel to pray, think “this I do not to submit myself, but to dwell closer to Mother Earth”. Adopting some form of soft polytheistic viewpoint may help ease inner conflicts as well; thinking of saints and other figures as avatars/versions of older deities, for example. Adopting some form of Pagan Gnosticism as a world view may help resolve some issues as well. Some would consider Christianity but another form of Paganism. If you’re expected to wear a cross, find one that incorporates a tree emblem, or get a Celtic or equal-armed cross, to make it more meaningful to you. Of course, one need not have any kind of altar to practice Paganism. A person could actually do everything mentally, visualizing devotionals, rituals, energy work, everything. However, it is beneficial to have some kind of touchstone in the physical world (especially if you can’t get out in nature as much as you’d like), to prevent a feeling of disconnect or “being in one’s head” all the time. If you have a small space to yourself, preferably the top of a bookshelf, then you can establish a discreet altar. You can use animal figurines to represent gods and goddesses, as most deities have animal associations. The Yule season is a great time to find altar items with a hidden meaning: a regal reindeer figure could represent Cernunnos or other antlered gods, you may find angel figurines that remind you of certain goddesses, and some rustic or unusual “Santa” figurines are reminiscent of Pagan gods. You may even want to adopt Christian statuary for use on your altar. How can one not think of the Star Goddess when viewing one of those statues of Mary crowned with stars and standing on a globe? If you don’t have a lot of privacy, you’ll have to get creative with how you commemorate even day to day devotions. There are Pagan prayers that can be used with a traditional rosary, and doing so can be a ritual in itself. Also, there are traditional rosaries that have a tree for the crucifix. Prayer for your Druid Beads by Sarva Antah is a very easily memorized set of song prayers that honors nature spirits, ancestors, and deities. Yes, doing the prayers silently counts, as does simply meditating on the spirits, and no one around you would be the wiser. Some simple ideas for symbolic foods that can be easily obtained to commemorate the holidays are: an apple slice for Samhain, pork or gingerbread for Yule, a dairy food or honey for Imbolc, an egg for Ostara, a strawberry for Beltane, an orange slice for Midsummer, bread or berries for Lammas, and fruit salad for Harvest Home. Here is where you may feel the most limited if you are of a mind to make magic a vital part of your lifestyle. Yet, it can be done. Use ordinary objects for your “tools”, and ordinary actions as your “works of magic”. Kitchen magic can be very subtle, using a wooden spoon as your wand and the entire contents of the kitchen as materials. Don’t forget about the subtle use of color magic and visualizations. You can simply send your energy out in accordance with your goal, and that requires no materials nor spoken words at all. Yes, every little thing you do (with intention) is magic! In your mind, dedicate whatever you’re doing, toward your goal. There are a number of divination methods that require no special tools. Divination of Nature requires only your observance and intuition and includes the interpretation of dreams. In bibliomancy, one flips open a book, and reads a randomly selected passage. It is possible to use an ordinary deck of playing cards for divination. Pendulum divination can be done with only a key on a string. If you are just starting out and seeking a way to learn all you need to know, I would recommend that you first learn all you can from trusted internet sources. (See my recommendations on book and internet resources.) Try to memorize what seems important, then clear your browser history. It may be tempting to obtain a lot of books, but if you have access to a good library, reading up on mythology and philosophy will give you a better foundation in the beginning. Some libraries will even order Pagan books if you put in a request. You can read them at the library if you feel it isn’t safe to bring them home. If you are embarking on a hidden practice, take heart. Know that the circumstances holding you back are most likely temporary as are all things in life. You may even learn and grow from the experience. While I wouldn’t exactly call myself an expert, I have been a Pagan for about 30 years. These are a few resources I would endorse for Pagans just starting out, especially those on a Celtic and/or Norse path. Real Magic, Real Energy, Neopagan Rites… all great stuff to start out with. Including interviews across the spectrum, this book is a great way to compare the various Pagan paths (even though now it has become a little outdated, as new paths have arisen over the years). Many of the interviews are with founders of traditions, making this compilation of great historical significance as well. A similarly good source is Drawing Down the Moon by Margot Adler. This book has stuck with me through the years. These simple techniques in natural magic are of benefit to anyone of any Pagan path. The earliest editions of this book have beautiful art nouveau illustrations. I recommend this not for the ritual style, but for the deep insights and ritual themes Alexei had for the holy days. Recommended especially for soft polytheists or duotheists, this little book is a treasure trove of beautiful of prayers and blessings. A nice source and light read for customs and themes of various holidays throughout the year. A clear and readable translation of the Elder Edda. Yes, this is a children’s mythology book, but a great read and easy introduction to Norse mythology for adults as well. It’s a good place to start if you’re not ready to tackle the Eddas. Maria has some really mind-blowing amazing insights into Norse mythology. If you can’t find her book at a reasonable price, check out her youtube channel: Lady of the Labyrinth. If you lean more toward soft/squishy polytheism, and want to combine Norse and Celtic pantheons, this book will provide a lot of ideas and inspiration for it. However, does not include any guidelines on forming Waincraft ritual. A great source for descriptions of Pagan paths, articles, and finding local Pagan events and groups (not just for Witches/Wiccans). Message boards and articles, basically a ton of information. Check out their page titled A Pagan Primer. A great organization and a great resource for rituals, chants, articles, and Indo-European Paganism. A good place to start if interested in Celtic Reconstructionist Paganism. The organization is no longer active, but the website is a great source of articles and information. Their name means “sacred kinship”. A great source for Gaelic polytheism. So much information and resources. So. Much. Ásatrú basics, very informative for beginners. A wonderful online source for Norse poetry, invocations, and especially- song. The main online source for this fairly new tradition. Abundance, or the Lord of Plenty- as I like to call him, is the third primal Power in Waincraft, the second born of Mother Night, and bright twin of the Wild Father. In creating a sculpture to represent him for my altar, I drew on imagery of what this Power represents for me from Germanic and Celtic sources, but also a lot from intuition. As for how I made the sculpture, just as I did with my Wild Father sculpture, I started with a regular batch of salt dough (2 cups flour, 1 cup salt, and about a cup of water). After kneading, I broke off a big chunk of the dough and formed a rectangle and rounded off the top edges for shoulders. I rolled out some more dough and cut a circle shape with a drinking glass. This I placed above the shoulders as a backdrop to the head and celestial objects around the figure, making the basic size and outline match its twin sculpture. The beard and face were all one rounded rectangular piece. (When attaching a new piece, always dampen the base surface.) I used a cutting tool to add details to the beard. A tiny rope of dough was used for the nose/eyebrows. After making soft indentations for the eye-sockets, I attached tiny balls of dough for the eyes, poked holes for the pupils, and cut horizontal slits to suggest eyelids. I cut grooves into the sides of the figure to suggest arms of a robe. The wheat-like texture on the right of the figure was made with little scissor snippets. The cornucopia, pig, and bird shapes I added to the base were cut out of dough flattened with a rolling pin. Ropes of dough were used to make the tree branches and the sun rays. The apples and leaves on the tree, and fruit in the cornucopia were all made from small balls of dough. For the leaves, I flattened small balls of dough and pinched each end. The stars around the head started out as tiny balls of dough also. I cut and carved their shapes after attaching, pressing down with a small tool, the areas I wanted to recede into the background. For the opening to the cornucopia, I pressed into the base a little with my thumb, then attached a rope of dough around it, smoothing with dampened fingers where the rope joined to form a circle. I then pressed ridges into the cornucopia basket. When completely done shaping and blending, I baked it at 250°F for several hours. After cooling, I painted all the grooves and crevices with an acrylic craft paint in the shade of burnt umber to get a good contrast. I used a paintbrush dipped in water to blend a little bit of the color to other areas for lighter contouring. When this was dry, painted the rest of the piece. When all of this was dry, I sprayed the entire piece with a coating of clear acrylic. My new altarpiece now sits upon the fireplace mantle next to a small cauldron. I hope this description of how I made it was useful to anyone wishing to make something similar. Wildness, or as I prefer to call him- the Wild Father, is the second primal Power in Waincraft, the first born of Mother Night, and dark twin to the Lord of Plenty. In creating a sculpture to represent him for my altar, I drew on imagery of what this Power represents for me from both Celtic and Norse lore. Instead of telling you which deities I drew on for this, I will just say that one was a deity I followed in my early days as a Pagan, and one is a later patron. The idea that both deities draw from (or are aspects of) the same Power, holds deep spiritual meaning for me. Many other deities come to mind as well when I gaze upon this altar piece. I don’t want to name specific names here because I want others to see what is most meaningful to them. As for how I made the sculpture, I started with a regular batch of salt dough (2 cups flour, 1 cup salt, and about a cup of water). After kneading, I broke off a big chunk of the dough and formed a rectangle and rounded off the top edges for shoulders. I rolled out some more dough and cut a circle shape with a drinking glass. This I placed above the shoulders and a backdrop to the head and antlers of the figure. Working with salt dough is pretty simple. The shapes I add are usually rolls (for hair, beard, antlers, snake…) or balls of dough (like for the head). When attaching a new piece, always dampen the base surface. With dampened fingers, I continue to shape and blend pieces after attaching to the base. Small flattened balls of dough are blended on the face for cheekbones and a tiny roll of dough for the nose/eyebrows. For simple deep-set eyes, I poked holes with a toothpick. You may not be able to tell from this photograph, but one eye is closed. I cut grooves into the sides of the figure to suggest arms of a robe, and I dug deep grooves into the center to form a tree. I scratched texture into the sides to represent vining spiraling wild growth. When completely done shaping and blending, I baked it at 250°F for several hours. After cooling, I painted all the grooves, crevices, and backdrop of the antlers with an acrylic craft paint in the shade of burnt umber to get a good contrast. I used a paintbrush dipped in water to blend a little bit of the color to other areas and for lighter contouring of the hair and face. When this was dry, I sponged on brighter colors on many of the raised areas and painted the snake a sage green. When all of this was dry, I sprayed the entire piece with a coating of clear acrylic. My new altarpiece now sits upon the fireplace mantle. I hope this description of how I made it was useful to anyone wishing to make something similar. Check in next week and I’ll tell you how I made my sculpture of the Wild Father’s twin- the Lord of Plenty. Over the past few months I’ve been contemplating a new paradigm for my personal spirituality, not so much a “changing of the gods” as when I went from Celtic Recon to predominantly Heathen, but rather, something that could combine the two or even take the focus a little bit away from culture-based spirituality. Also, something that acknowledges squishy polytheism. At first I looked into Proto Indo European religion and liked a lot of what I read. However, the harshly patriarchal mythology left much to be desired. Waincraft kept popping up as a possibility. I really liked a lot of the ideas, but coming from scholarly traditions like ADF and CR, I was a little put off at first by the amount of UPG or SPG. However, the more I started looking into it, the more it resonated. It is really well thought out. I’m actually gaining a deeper understanding of Northern European Paganism through this system. So I began to really contemplate the world view, Powers and new mythology of Waincraft. After a while I began to think about how I might rearrange my altar space to reflect my new framework and incorporate some new deities and combine Waincraft and ADF symbolism. So one day I was doing my daily (or semi-daily) devotionals, asking the Kindreds for guidance as I shuffled my tarot cards. One literally jumped out and landed in front of me face-up and upright. I took it as a sign that this card was my omen. A chill ran through me. The visual of Queen of Pentacles made me immediately think of the Star Goddess (Night)–the first deity of Waincraft. I took this to mean that the Spirits wanted me to go forward on this new path. 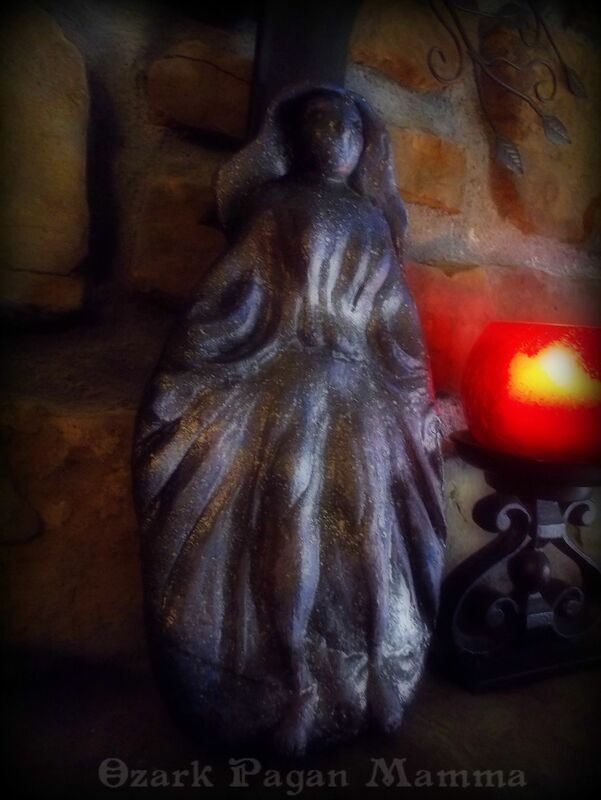 I decided I would rearrange my altar tiles and buy, make, or re-purpose an image to represent the star/night goddess on my altar. As I picked up one of the tiles to rearrange (the Heimdall tile I made three years ago), it crumbled in my hands. The tile had broken into several pieces the year before, as did most of the others I had at the time, and I had glued them back, but I guess the damp spring we had this year was just too much humidity for them. Upon examining the other altar tiles, I discovered they were in the same ready-to-crumble shape. I hadn’t planned on such a big change in altar layout, but it seems this was meant to be. I will still be honoring my same gods, but their representations are going to be different, as are the way I think of them in relation to each other and the world. So starting at the beginning, I made a representation of Mother Night. I wanted to re-purpose an already made statue for this, for the sake of sturdiness and longevity, but unable to find the right one, I decided to go with making one of salt dough to serve for now. Instead of using “strong salt dough” like I’ve done in the past, I just used the regular formula: 2 cups flour, 1 cup salt, and about a cup of water. And instead of air drying it, I decided to bake it at 250°F for several hours. I went with a flat back like for the tiles I made, and flattened the bottom end so that it could be stood up when finished. I wanted her to have long flowing robes and outstretched arms. Since the robes drape down from her arms and flow into her diaphanous dress, it forms a good solid shape with no small parts to break off. The resulting piece was thick, solid, and sturdy after oven drying. Oven dried salt dough seems more bread-like than air dried, and less grainy. It may still break eventually, but maybe not crumble apart like the other ones did. The first coat of paint was glossy black. I then sprayed on small spurts of various shades of purple, some blue, and a little bit of silver. Later I sponged on some lavender to highlight some places that needed it. Finally, I splattered on white paint with a toothbrush to make stars. I’m still working out how to combine ADF with Waincraft for my personal spirituality. But this beginning feels right. I feel like I’m being true to myself and reconnecting with some powers and energies that I had long forgotten about.